That's a nice deal. I'm interested to hear how the braking is on the way down tomorrow. Will do. So far, they feel good. Reynolds does braking right. That version might look good in person, but I agree it's boring on the website. A better accent color than black or that blue. None of the current colors make me want to replace my Allez. My most recent, and dog willing, ultimate n+1. I likely won't take delivery until next June. I'm just getting the frame set. Trying to use up as many stray parts as I can, in and effort to not be tempted to buy another frame to use them on. My first, ever, red bike. 1988 Expert. I might just embrace my inner grumpy old man and put Campy on the roadie. Shimano's putting out way to much crappy isht these days. I'm not grumpy, when I ride my Campy. Are you going to use Di2? Thanks! Do many go out the door there? Mostly 4s, then 6s are second most popular. We have only had the 3s on hand for a month or so, however, so we've yet to see how they do. Riding season really doesn't start here for another month. Yes. I still love my Chorus 10. Shimano people can't say grumpy old stuff like that. Ten speed Campy hoods, FTW. One of the local randonneurs is thinking of jumping straight from 9 speed to 11 speed Campy. I forget you guys are like Australia. 760 out the door. Give or take, because Bloks were on the menu too. Hard to pass up. Yow. If they had a disc version at that price, I'd be tempted to pick up a pair just because. I mean, it would be totally dumb, but I'd still be tempted. Not for the first time nor the last. Beetroot gained popularity here due to posts by @coasting, an eccentric Londoner who died a few years ago. Ah. Yeah, I've seen a couple (literally two) reports of a crankset coming apart. Chewing up cables is a x700-series thing, though - haven't heard of that happening with x800 and newer. Difficulty removing the wheel is new to me, too - is this a problem that people are having with Shadow Tech RDs? I dunno - maybe I don't have my ear to the ground, but the number of complaints I hear is so minimal that I have a hard time believing there's a lot of problematic stuff going on. Meanwhile, Di2 is awesome, mechanical front shifting has gotten very good, rear shifting is quick, light and precise up and down the line, the hydro stoppers are crazy good and people are saying that the new rim brakes, direct mount in particular, are a huge improvement, too. Over on WW there are people with half a dozen broken cranksets together, and even a few on ST under tri geek watts. The cables are still getting chewed by X800 and RX000, though maybe at a reduced rate. And yes, the rear wheel removal is on frames with a lot of material behind the BB and short chainstays with the Shadow RDs. The more forward position of the upper jockey wheel means the wheel has to move more forward to clear it, and on some frames that means the tire hits the back of the BB and can't get past. In the worst cases, the tire has to be deflated for rear wheel removal or replacement. Again, bad enough on Pinarellos that Sky puts the RD out of Shimano's spec, to the rear, to solve it. I'm sure Di2 is great, and I'll pay for it on my tri bike because of being able to shift from the basebar. I'm not paying for it on my roadie though, in large part because I think it should be on 105 by now and not commanding such a price premium. And the R8000 rim brakes feel awesome just squeezing the levels on AG's new bike. But yeah, overall I don't get a warm fuzzy from their quality. Weight loss plans are in full swing. I picked up a set of those R3's from Performance. They're light. The Reynolds wheels? Please let me know what you think of them, especially braking/ hub quality. I keep getting tempted to pick up a pair whenever PB has one of their crazy sales, but I'd like to know how much they've been cheaped out. I'd really like it if they had i9 hubs. but I'm sure that's not the case. Nice! The covetousness factor of that is high; I wish I could come across something like that to solve my bike frame conundrum. What's the typical tire clearance on classic steel? I hear both ways about "plenty for 28s" and "tighter than a decade ago". That's one of the things that's kept me from getting one. Good lord man, the R Threes are just retailing for $699 right now? Someone hide my credit card. Get them, and if you post asking if you got a good buy, I promise to say yes. I should be getting ready to ride with my friends. But instead I am getting ready to go to work. Sad! Almost already did, but they're 5mm deeper than my Belgiums. My inner (outer) tri geek won't spend that much for shallow training wheels. 11 is old school. Campy 12 for the win. I'm ready to ride with my friends and Im getting ready to go to the start. Happy! It varies. 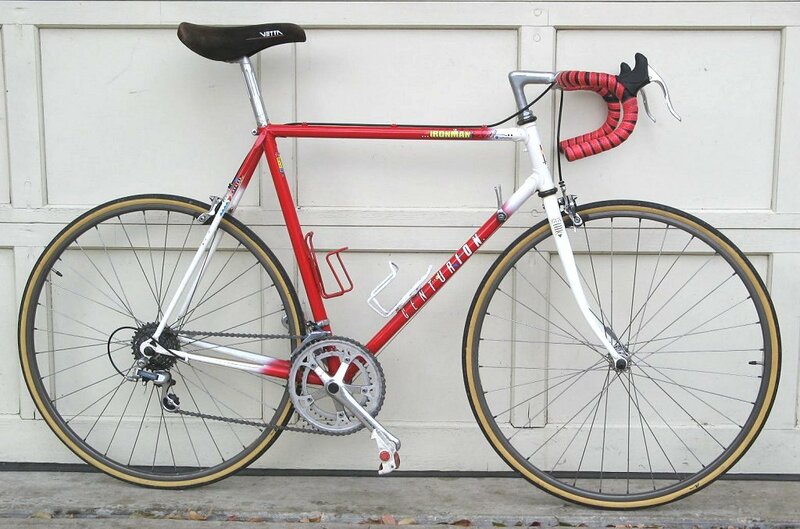 My mid 80s Pinarello could only handle a 23 up front, early 80s Univega Super Sport barely fit 25s. 1988 Trek 400T could fit 35mm knobbies. I'm ready to ride with my friends and Im getting ready to go to the start. I hope to sneak in a short ride after work and before the predicted afternoon thunderstorms. Plan is to make a short out/back to Valley Forge. Will include flybys of the WaWa that @indyfabz barely missed on his recent ride out this way. I would like a good, even lighter set of wheels, but the one thing that I wish Reynolds (and Fulcrum, for that matter) would change is their internal width. They're still at 17mm and I'd love it if they'd plump 'em up by a couple mm, at least. It's one of the reasons that I'm irrationally tempted by the Bontrager Aeolus Pros, despite being slightly heavier than my Assaults (though honestly, I'll probably build a set of wheels with some LightBicycle rims before buying any of the aforementioned).